The Pyle PREMIER Series 2-Channel Wireless Microphone System will provide you with the performance you've been looking for. Whether used for work or play, this dual cordless microphone system is easy to setup, easy to use, and best of all, will give you an amazing high-quality audio experience. Choose from 8 different channels to transmit over. Enjoy hassle-free and reliable wireless sound transmission with today's latest system technology with this all-in-one package. Excellent sound production for vocals or speech and perfect for just about any event on stage, in the office or even at home. 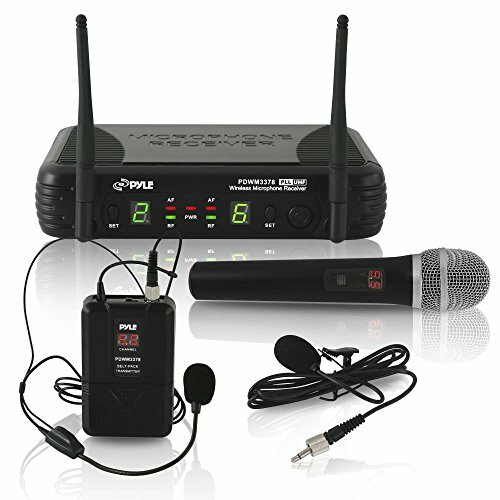 Comes with everything you need to perform including 2 wireless handheld transmitter microphones. No matter what you use it for, the Pyle PREMIER Series 2-Channel Wireless Microphone System will take your sound and style to the next level. Operation Range: Up to 160'+ ft.
WIRELESS - Enjoy a cable-free environment & make it easy to own the stage without getting tangled up! The ultimate in freedom during vocal performances for professional on-stage singers & performers with PYLE wireless microphone system. ASSORTED MICS - 1 handheld MIC & a body-pack transmitter to clip comfortably on any garment for use with included headset/lapel microphone. For any occasion this system allows you to sing, talk or vocalize, leaving hands free to play any instrument. UHF - Wireless UHF signal audio transmission provides unsurpassed performance with operation up to 160 FT for clear, noise & distortion free, crisp vocals & excellent sound reproduction. Great for conferences, broadcasting & social events. 8 FREQUENCY CHANNEL DESIGN - Choose from 8 different frequency channels each with adjustable independent volume controls providing broad frequency response range & low distortion with high signal/noise ratio performance. HIGH QUALITY- Battery operated wireless microphones are designed for extended use providing excellent audio quality with its omni-directional audio capture and projection of the subject with simple & hassle-free operation.